Bananas are one of the most consumed foods in all the world, and the U.S. definitely eats their share. Despite the huge market, the states have very limited areas that possess the tropical climate necessary to produce the perfect banana, and they must be imported from far away lands. The majority of bananas eaten in the U.S. are cultivated in South America, but the fruit is picked long before it has matured, so it can survive its lengthy travels to its less tropical destinations. This is where the secret life of the banana begins, and for many, it begins in the Bronx. This New York borough is not exactly the place that comes to mind when you think “tropical and fruity”. It is however the home of one of four banana ripening facilities that ship out of New York, sending millions of boxes a year of sweet, yellow bananas to the masses. 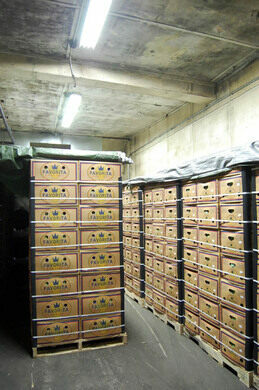 At any given time, the Banana Distributors of New York on Drake Street may have up to 20, 000 cases of bananas in the building. To achieve maximum sweetness and desired ripeness from the hard, green, refrigerated fruit that has traveled so far, the bananas must be “tricked” into continuing their ripening process once it has been tampered with by early picking and extended refrigeration. 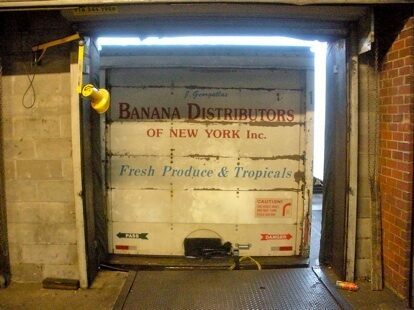 When the bananas reach the facility, the ripening process is kick-started in pressurized, temperature- and atmosphere-controlled rooms that convince the fruit it’s back in its sunny, humid home, and not in a warehouse on the East Coast. There are seven controlled stages of ripening, each stage closely monitored, so that wholesale customers can get exactly what their particular market prefers. The process is a delicate science, with the rooms able to ripen a banana to perfection in 5 days at a precise 64 degrees, and over a 24-hour period, each roomful is gassed with ethylene, which is produced in a steady stream from generators. 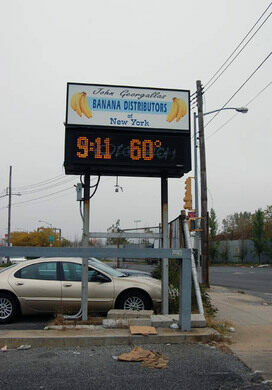 Ethylene, a highly flammable plant hormone, was the cause of many banana ripening room deaths in the earlier days of the injection technology, when explosions of ripening rooms were commonplace. Banana Ripening Facilities are not usually open to the public, but tours are often granted to “students” or persuasive curiosity seekers.